Dice your onion and heat 2 tablespoons of oil in a large skillet on medium low. Once the skillet is heated through, add your onions and slowly cook, stirring frequently, until the onions are soft and caramelized. This should take approximately 15 minutes. Set aside. In a large bowl, mix together all the ingredients for the burger patties together and mix until well combined. Remember to finely chop the mushrooms so they are roughly the same size as the ground meat. Add the salt and pepper to taste. Grab about 7 -8 oz of the burger mixture and roll into a ball, then flatten into a patty shape. Add a small amount of the remaining oil back into your skillet just so it is enough to coat the skillet. Turn the skillet up to medium high heat. Cook patties for about 3 - 4 minutes per side, adding cheese once you've flipped the patty to allow the cheese to melt. To cook in your grill: Preheat your grill and add your patties to your grill. Cook for 3 - 4 minutes and add the cheese once flipped to melt the cheese. 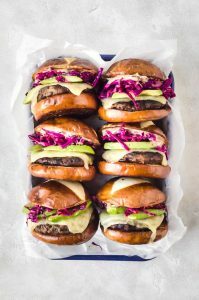 Place the patties on your buns and top with avocado. Toss the cabbage with lime and add to the burgers. Mix together the chipotle and mayo and brush on the cut side of the top of the burger buns. Serve hot.